I had wanted to know more about the LGBT subject for awhile now. I missed a conference on it once before and so when I noticed this book, I quickly got a copy and dived in. I did not know much about it, not about what their arguments were and how they justified and explained their lives in light of Scripture. The book presented it very well with every chapter beginning with a "gay Christian" argument followed by a biblical answer. Brown was fair in his treatment of the subject with grace and compassion. He explained the biblical position of homosexuality through context and word study. And as much as the LGBT scholars try to read it positively into God's word, Brown has shown that "every single reference to homosexual practice in the ancient Jewish world is 100 percent negative—sometimes in the strongest of terms—and there is not a single positive reference to be found." And I like the way he explained the creation of man and woman. I have never looked at it this way before: "The author of Genesis is explaining to us that because the woman was taken out of the man, the two are now joined back together as one in marital union, each one uniquely complementing the other." Then he quotes A.B. Simpson saying, "Man was created male and female. This does not mean, as it would seem at first from the language, that he created the male and the female at the same time, but He created male and female in one person. The woman was included in the man physically and psychically, and afterwards was taken out of the man and constituted in her own individuality," concluding that "only a man and a woman can be joined (rejoined!) together in this way." This is a must-read book. You may or may not agree with him, but at least he presents both sides and faithfully explains the Bible as it is intended by the original writers as inspired by God. And most of all, he is firm in his stand that we are all broken people before God and we are all in need of God, as heterosexuals or homosexuals, in need of his grace, mercy, love and redemption. Firstly, the answer to the book's title is: Yes. Being born again has nothing to do with sexuality. "These fellow United Methodists seem to be stating that everything written in the Bible is God’s Word, and that it should be applied without question today because “His Word is unchanging.” But I don’t believe this is actually how they approach Scripture. Nor is it the way Christians have generally approached Scripture across the last two millennia. Had the early church held these assumptions consistently, they would never have reached the decisions that circumcision was no longer required of Christians, or that Christians were no longer bound by much that is found in the Law of Moses. We would still be worshipping on Saturdays, eating only what was kosher, offering animal sacrifices, and administering capital punishment for everything from working on the Sabbath to rebelliousness on the part of children (Jesus never explicitly taught that these portions of the Scripture were no longer binding upon his followers; this call was made by the apostles at the urging of Paul). Further if we consistently applied these same assumptions to what Paul teaches about women in the New Testament, the female members of the United Methodist Church would pray with their heads covered; they would remain silent in the church; and they would not be permitted to teach in any church gathering where men were present. This is, in fact, how many conservative Christian bodies still read the Scriptures, hence I recently received a note from a member of a fundamentalist Baptist church who stated unequivocally that United Methodists are "unscriptural Christians because you ordain women." There are more than 200 verses in the Bible that allow slavery as an acceptable practice, even permitting the beating of slaves with rods. The New Testament authors, as with their forebears, could not imagine a world without slavery. If Methodist Christians consistently held that everything in the Bible is God’s Word and that it is unchanging — and by this they meant that what the Bible allows we must allow, and that what the Bible forbids we must forbid — we’d still support the practice of slavery today." The book does treat those verses and argument about slavery and status of women in the bible, and the conclusion is still that homosexuality is considered a sin and prohibited by God as a way of living. "If by that you mean, can you be committed to Jesus and serve Him faithfully while still having homosexual attractions—recognizing those attractions as contrary to God’s design and resisting them as sinful—then the answer is yes, of course!...On the other hand, if by being gay and Christian you mean, can you be committed to Jesus and serve Him while practicing homosexuality—embracing your homosexual attractions as a gift from God and acting on them, thereby affirming your “gay” identity—then the answer is absolutely not. The Word of God is clearly against it." 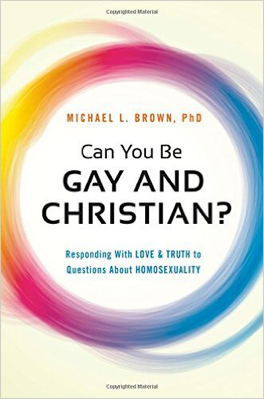 Brown, Michael L.. Can You Be Gay and Christian? : Responding With Love and Truth to Questions About Homosexuality (p. 213). Charisma House. Kindle Edition. I checked out Michael Brown's askdrbrown.org site. I think that he holds traditional Pentecostal views of the scriptures - especially on this issue. I once held many of those views. My approach to biblical interpretation has changed. I do not see the verses in question as a reflection of the timeless will of God as he seems to. Doubtful he and I could agree on this issue as the foundational approach to the scriptures is probably different. Of course this is the issue of our time. It reveals how we read the bible. Do we read it through the life, ministry and teachings of Jesus or through the proverbial eyes of Moses, Samuel and Solomon? I'd be happy to discuss this more but you may not have the time or interest. :) why do I not have the time and interest? In this sense I suppose I hold the same traditional view he does, but I am not sure of the Pentecostal part. And in reading Scripture through Jesus or the OT prophets, he does handle the issue too and I agree with him that Jesus comes to fulfill the law and with regards to this topic, it is the same prohibition prescribed in Leviticus. What is your view on homosexuality? Some feel that Moses was a type of pope whose writing was infallible and from the very lips of God. That comes up short for me because that is not how I see the Lord interacting with leaders throughout history. It also creates issues around the commandments he gave regarding the execution of people who commit certain types of sins. He even commanded a person carrying wood on the Sabbath to be stoned. I certainly admire Moses and think that he was a great leader but I do not consider him or his writings to be infallible. No "man" hears God perfectly. To believe such a thing is to idolize the man and accept ideas like stoning a man for gathering wood on the Sabbath (Num 15:32) or murdering infants and children because their ancestors mistreated Israel when they left Israel. God has not established a super order of infallible popes. He has always worked through fallible men and women. Sometimes accommodations were made for hard hearts. Concepts like "an eye for an eye" (Ex 21) were certainly not an expression of the heart of God but Moses' capitulation to hard hearts. I think that understanding these things helps us to make sense of the bible. But seeing them coming from the heart of God maligns the character of God and presents Him as something other than what we see in Jesus. I believe that there are tremendous truths that are taught in the bible if one does not elevate the beliefs of humans over the heart of God. Reading the OT we can learn about how great men like Moses and Solomon sometimes missed the heart of God. It does not lessen these men in our eyes but makes them human instead of popes. So the question is how do we read the scriptures. Do we simply accept immoral acts as God ordered simply because a prophet says "thus says the Lord"? Or do we understand that great men like Moses and Samuel had feet made of clay and sometimes did not perfectly understand the will of God? That said, I do absolutely embrace what Moses, David and the prophets wrote as profitable for teaching, for reproof, for correction, for training in righteousness. I love the many lessons that we can learn from Genesis. Reading the creation story simply inspires me. My heart weeps for Adam and Eve when I read of Cain killing Abel. The accounts written down by Moses of the flood, the Tower of Babel, and Abraham's family and ancestors teach me so much. I learn so much about God and humanity when I read these accounts. One of the absolute favorite parts of leading classes like "The Bible in 90 Days" and "Making Sense of the BIble" is talking with people about these very issues. Helping folks see the eternal messages in these passages encourages me greatly.